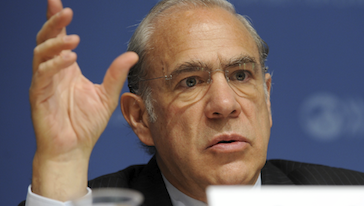 Angel Gurría is the Secretary-General of the OECD since June 2006. He was re-appointed to a second mandate in September 2010. As OECD Secretary-General, he has reinforced the OECD’s role as a ‘hub” for global dialogue and debate on economic policy issues while pursuing internal modernisation and reform. Mr. Gurría is a Mexican national and came to the OECD following a distinguished career in public service in his country, including positions as Minister of Foreign Affairs and Minister of Finance and Public Credit in the 1990s. Mr. Gurría holds a B.A. degree in Economics from UNAM (Mexico) and a M.A. degree in Economics from Leeds University (United Kingdom).